We have returned with our bag of good reads, helpful strategies and inspiration. We left comments at each post but some did not appear to have been received. Thank you, Wenda! 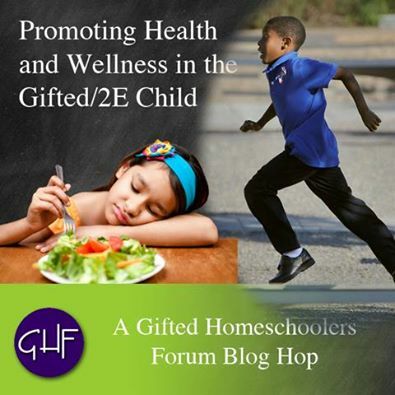 The vastness of the problems surrounding health and wellness and environmental issues can seem overwhelming; but you have shown how teaching our children about it openly and making small changes in habits can lead to improved health. 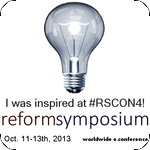 Cara, thank you for sharing what is working for you; while we wait for the appearance of that manual that was supposed to accompany our own individual, asynchronous, eccentric, atypical, outlier child. Establishing routines, spending time in exercise outdoors, setting some quiet time and ensuring that mum takes adequate care of herself are all wise measures! Thank you for sharing some of your strategies for dealing with the sensitivities and OEs – the bean bags, stretches, swinging and spinning, the animal walks and breathing exercises! I am glad she is happy with the new seat! That will make life so much happier all round! Minimizing Stress, Anxiety and Emotional Outbursts ~ A Voracious Mind Minimising stress, anxiety and potential emotional outbursts by carefully choosing how, where and with whom we spend our time is omnipresent. Knowing who you are and therefore lessening stress, anxiety and potential emotional outbursts by careful choice of activities is such wisdom. Thank you for sharing. What fun ways of including incentives to exercise! I need to read Dr Sears L.E.A.N. kids book! There is a wealth of study topics offered here which would help the children learn to make informed choices about nutrition and health. Thank you for a great post! Yes Absentminded Professor meal distraction could be a problem for us too; particularly if circumstances caused us not to be eating together at the same meal time. Jen, I am just SO delighted to hear this good news! 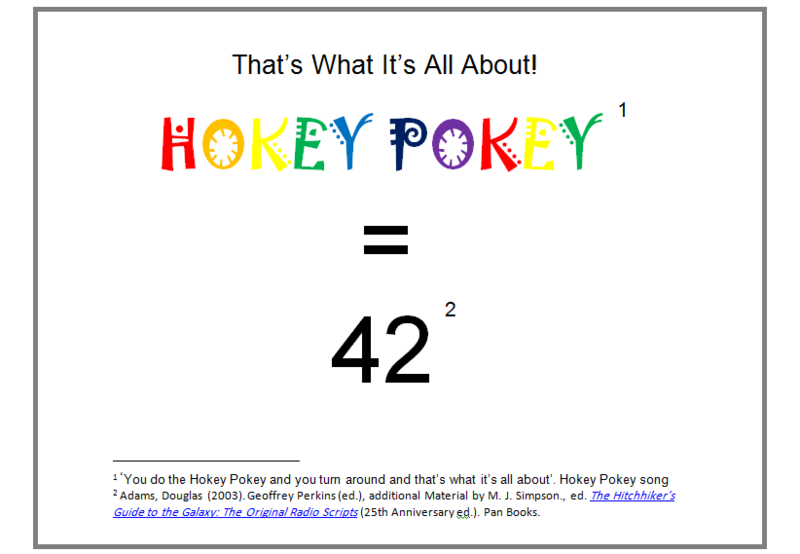 Thank you for a great post with lots of helpful suggestions and reference links! You are so right the key is getting them to recognize their feelings and when they’re getting anxious. Thank you and Principal Daddy very much for such helpful tips! I wish we could rewind and try those early dentist visits again using some of these suggestions! Coach Chris sounds like an excellent inspiring teacher! I love his emphasis on helping each individual student to achieve the best possible results and enjoy the activities. And we are home again. We have left messages where we could and will post about our experiences on the hop soon. 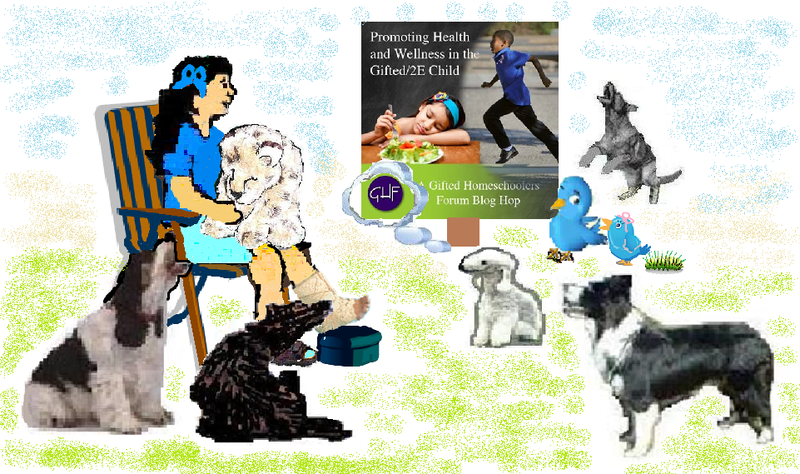 Ironically I did not have time to write a post for the Gifted Homeschoolers Forum April blog hop ‘Promoting health and wellness in the gifted/2E child’ because I was busy taking Sprite to appointments with psychologists, education consultants, paediatricians, specialists and to shoe shopping expeditions. Blog posts about these will be written soon, I hope. But, of course, Retweet wants us to go on the Hop and take her along with us! 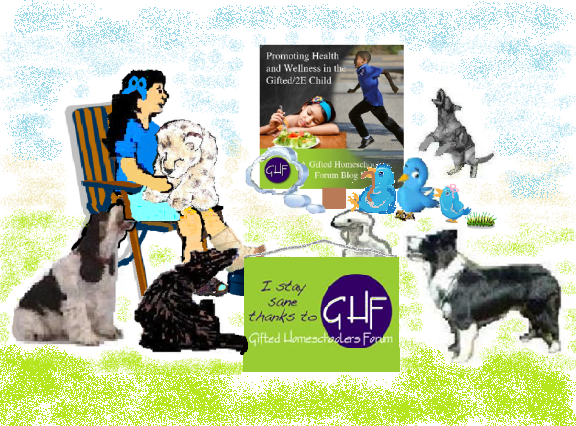 Retweet is hoping that someone will be giving advice about nutrition as she is trying to meet a variety of challenges when feeding her tweetlets. Whatever she does; Great Aunt Hashtag is bound to disapprove. The main challenge with feeding Tweetil is providing enough to satisfy his huge appetite without him becoming obese. He is a true Twitter bird omnivore and his favourite food is wormecelli which is quite fattening. Feeding Tweetelle is more difficult. She has always been a picky eater. Some days she would only eat food of one colour. The overexcitable Dabrowski Dogs also want to go on the Hop as they feel sure that Dabrowski’s overexcitabilities will be mentioned in some of the posts! 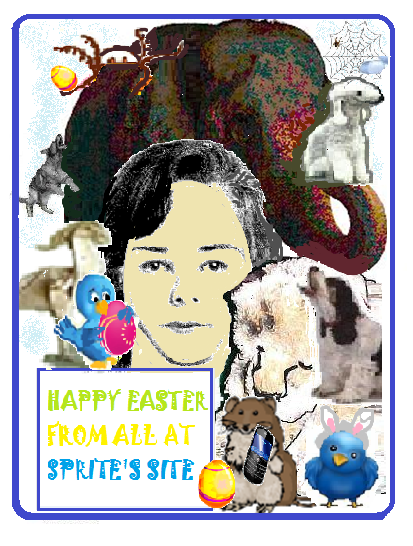 The Twitter Birds have brought another parcel for Sprite this week. 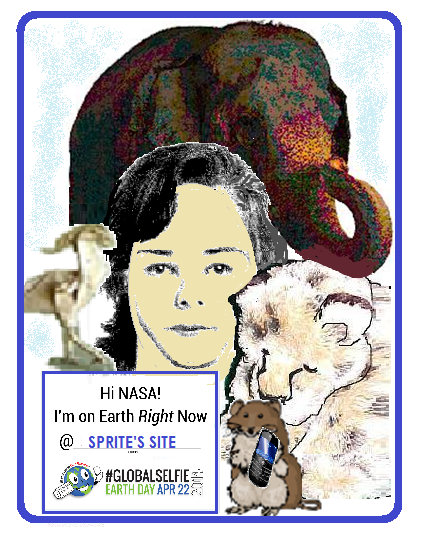 It contained the materials needed for Sprite to participate in a worldwide celebration of Earth Day this year with the NASA #GlobalSelfie event. Sprite’s Easter holiday homework was to write an essay with the title ‘That’s what it’s all about!’ It really made me think! For Christians Easter is the celebration of the events that are at the very core of our faith – that Jesus died on the cross on Good Friday and rose again in accordance with the scriptures in order to reconcile mankind with God. 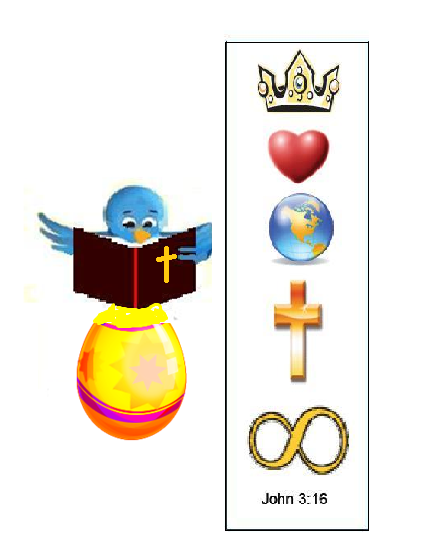 It is best summed up by the ‘Gospel in a nutshell’ verse John 3:16 For God so loved the world that He gave His only Son that whosoever believes in Him should not die but have eternal life. For Christians Easter = that’s what it’s all about! There was also news of a specially adapted performance of the musical The Lion King which will be suitable for people on the autism spectrum and their families to see the award-winning production in a friendly and supportive environment. Trained staff will be on hand, and dedicated quiet and activity areas set up, should anyone need to leave their seats. Slight adjustments to the production include removal of strobe lighting, reduction of any jarring sounds and lights focused into the audience, house lights being dimmed and flexibility to bring your own snacks. We even shone blue lights on the arch in the garden to support Light it up Blue.